Horseriding Travel Insurance is required by a wide range of holidaymakers, and probably should be considered by many who don't! Whether you are planning to take a tailor made holiday designed around your passion for horses, or you have your eyes on a horse riding trip on the beach for a day, take a look at. 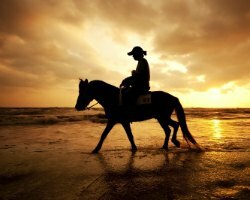 horse riding travel insurance. Either way, and as with any other activity on a holiday, it is really important that you make sure you are properly covered for horseriding on your break. If you are unfortunate enough to have a fall, be kicked or otherwise injured whilst riding, you will want to make sure that you can seek and pay for proper medical attention. If you were seriously injured this would extend to insuring you for the cost of being repatriated to the UK. Do, though, read all the terms and conditions carefully (remember you have a cooling off period of 14 days with any insurance policy if you find you are not happy with the cover) - as some policies will not cover riding at all, some will cover horse or pony trekking, whilst others will cover horse jumping and riding competitively. Likewise if you do not ride horses on every holiday you go on through a year you may find a one off single trip policy may be a better option covering your horse riding trip separately rather than an all encompassing annual policy. JS Travel Insurance are experts in finding excellent cover for specialist areas - and in particular they love adventure sports. They are brokers and tend to have a wider range of policies on offer than approaching an insurer directly. We understand from the company that their horseriding policy is proving exceptionally popular, and will cover you for recreational riding, and activities such as horse riding on beaches or through parks and woods. If you are looking to participate in horse jumping whilst on your trip consider a specialist horse jumping policy from the company. You will find horse jumping listed under their sports and activities. Again read the policy carefully to ensure it fully covers the activities you have planned. If you have a preexisting medical condition this need not preclude you from getting insurance, as JS also specialise in extending policies in this respect as well. Sports travel insurance from the renowned specialist sports insurer SportsCover Direct provides comprehensive cover on either a single day or annual multi trip basis for holidays worldwide. They cover a really wide range of equine based sports including Cross country horse riding (training and competition), Endurance horse riding (training and competition), Hacking (on horseback), Horseback Archery, Horseball Horse carriage driving (including competition, Horse jumping (training and competition), Horse riding - competitive, Horse riding - non competitive, Horse Riding Safari, Hunting (on horseback). The company also offer 'ActivityTopUp' - which means their cover can be combined with another company's standard annual travel policy negating the need to duplicate insurance cover. SportsCover Direct offer a separate policy which offers Sports Accident Cover including Physiotherapy cover, Loss of Earnings, Personal Liability Protection, Legal expenses, Personal Accident Benefits and Rehabilitation cover. This can be bought for use in the UK or abroad. Just select Sports Accident cover from the products list. The quote process with SportsCover Direct policies is really easy, and you can check the price of your policy without entering personal details, allowing you to decide whether it is cheap enough before progressing further. This information is based on journalistic investigation and research. It is not financial advice. Any information should be considered in regard to specific circumstances. Any suggestions followed up are done so at your own risk and your own research is key.